For the second day in a row, Joey Votto wore his socks high, and for the second day in a row, the Reds won. It’s officially their longest road streak of the season. Is showing off his socks what Votto is paid to do? When it equals wins, I think you could argue that it is. Mat Latos was completely awesome in this 2-1 win over the Cardinals. The RBI belonged to Joey Votto, who was 2-for-4 on the night, and Xavier Paul, who managed to get an RBI without getting a hit all night. Tonight Bronson Arroyo (RHP, 2-2, 4.24 ERA) tries to keep it going against the Cardinals when he takes on Jaime Garcia (LHP, 2-1, 2.89 ERA). First pitch at 8:15 p.m. The Reds are currently .5 games behind the Pirates and 0 games behind the Cards but they have a 0.004 winning percentage disadvantage. A Reds win tonight would catapult the Reds from third to first if it’s paired with a loss for the Pirates. The Pirates face a slightly easier foe in the Brewers at 8:10 p.m. This feature continues their story by following McCoy and Snedegar on their drives to and from Great American Ballpark for two days earlier this month. MLB Network equipped Snedegar’s car with two wallet-sized GoPro cameras over the roundtrip drives to give insight into their daily routine, how McCoy now watches a baseball game (at one point in the feature, McCoy says that he has not seen a home run land since 2003), and how revered McCoy is by Reds players, manager Dusty Baker and fans as he and Snedegar walk through the ballpark before and after games. Tune in tonight at 6 p.m. for a different perspective on the game. You don’t have anything to watch until 8:15 anyway. Go over to Red Reporter to read the roundtable responses to the question of what to do about left field. That will give you up to 5 potentially smart-sounding things to say about left field when you’re chatting with coworkers. It took four tries, but Mat Latos finally overcame his streak of terrible Aprils to start seasons. That it came in his second year with the Cincinnati Reds is not really a surprise, given how much looser he was coming into camp. Latos talked about this during spring training, mentioning the pressure that he felt after the trade in 2012. That feeling is over with this year. And the results have shown it. Consider his first three Aprils in the majors. 6.20, 4.98, and 5.97. Those are not the ERAs of someone who starts the season strong. An ERA below 2.00 and almost 40 innings. Back in the spring, Latos had this to say. 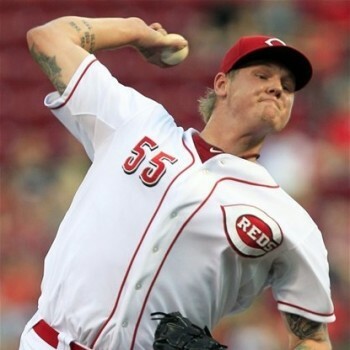 “I’m hoping to resurrect my April,” Latos said. With those stats, consider that mission accomplished. Now if he can make this his weakest month, then 2013 will be shaping up to be an amazing year. I’m so glad Mat Latos is a Red. Posted in Cincinnati Reds, NL Central.